Unwanted phone call can be a real nuisance, which is inconvenient and annoying at the best of times, especially for the elderly or vulnerable it can be quite frightening. It is a “plague” not only for individuals but also for companies. Mobile phone users can install some Apps to filter and block these calls easily, however, for companies, how to protect extensions from this nuisance? With Blacklist/ Whitelist feature, Yeastar S-Series VoIP PBX can easily help you get rid of them once and for all. This feature is similar to the blacklist of mobile phone, but there are still some differences. 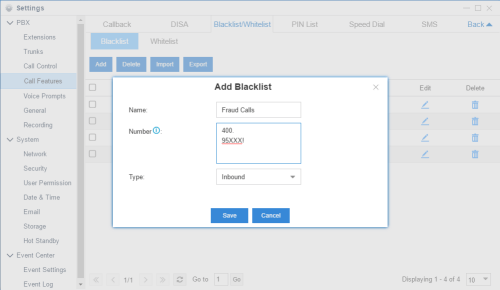 Blacklist on the S-Series VoIP PBX is used to block incoming and/or outgoing calls. If you list a phone number of the incoming call in the blacklist, you will not receive the call from this number any longer and the caller will hear the following prompt: “The number you have dialed is not in service. Please check the number and try again”. The system will then disconnect the call. Likewise, if you list the phone number of the outgoing call in the blacklist, you can not dial that number any longer. Nuisance calls are varied and usually attempt to promote a product, service, aim or ideal to you, or even defraud and blackmail you. 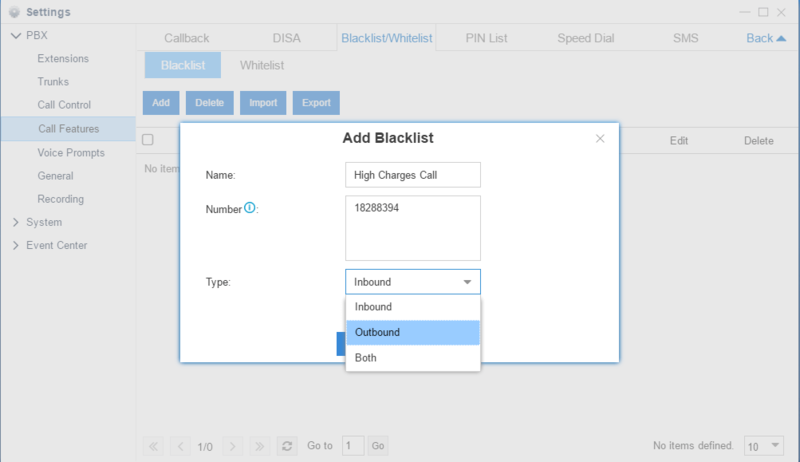 Categorising the blacklist will greatly help companies optimize phone management. It can be easily found that lots of nuisance calls are of same number segments. In this case, you can use the wildcard matching to flexibly block the phone number with some specific segments. For example, if you enter “400.” in the number field as below, all phone numbers of any length beginning with 400 will be blacklisted. While entering “95XXX!”, all five-digit numbers beginning with 95 will be blacklisted. In addition to some nuisance calls, you may also encounter “one ring call”. If your phone rings once, then stop, think very carefully before calling that number back because your phone may face high charges. Such “ring-back” or “ one-ring” scams have long plagued the telecom world, but now the problem has come back strong worldwide. With Yeastar S-Series VoIP PBX, you can also prohibit your extensions to make outgoing calls to these numbers to avoid huge losses. You probably meet a problem that the number segments of your customers’ phone numbers happen to be listed in the blacklist. If so, how to deal with it? Don’t worry about it. 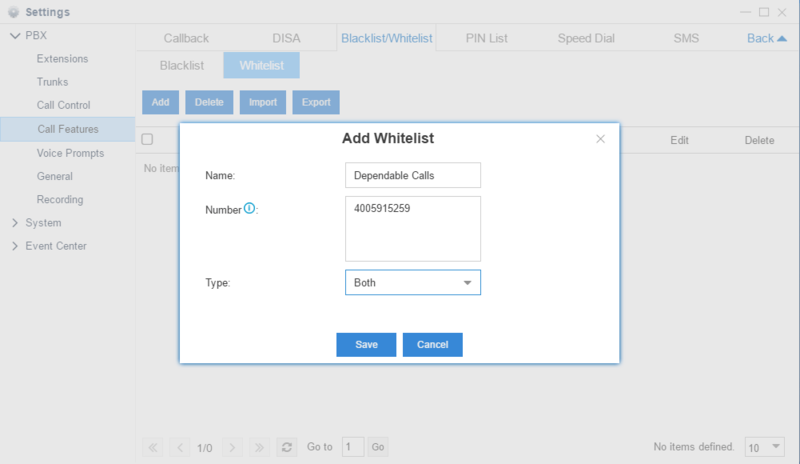 Whitelist feature of S-Series VoIP PBX allow you to add dependable incoming/outgoing numbers which has higher priority than the blacklist. For example, we listed all phone numbers beginning with 400 in the blacklist before, however, your customers’ phone number is 4005915259. Simply list this number in your whitelist, you can make outgoing call to this number and also receive incoming call from this number. 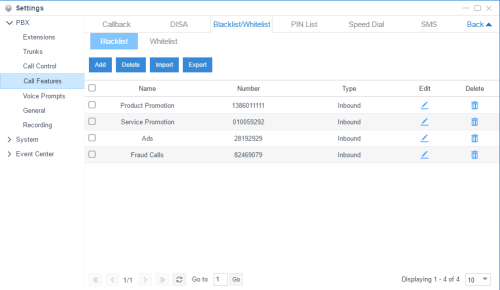 In addition to the blacklist/whitelist feature, S-Series VoIP PBX also provide built-in auto-call recording feature to automatically save the conversations of the fraud calls, providing dependable evidence for tracing the criminals.